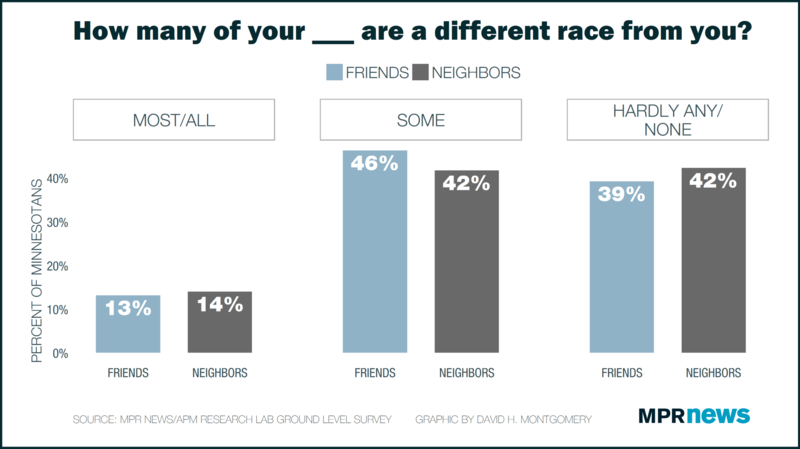 Ground Level: Friends, neighbors often don't cross race lines in Minn.
How many of your friends and neighbors are a different race from you? If you're like many Minnesotans, the answer isn't a large number. 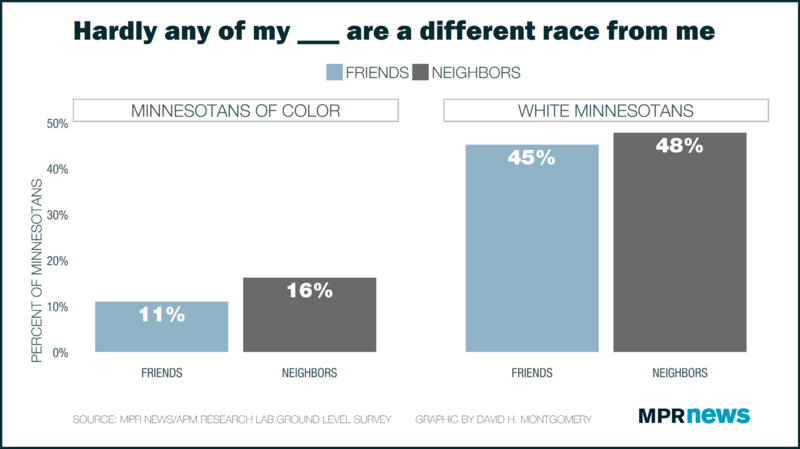 Only a small portion of Minnesota adults said that most of their friends or neighbors were different races when MPR News and its sister organization, the APM Research Lab, asked this question in the late summer of 2017. Around 40 percent of the state — 1.5 million Minnesota adults — say hardly any or none of their friends are a different race. The finding from the Ground Level survey doesn't surprise experts — and not just because Minnesota is around 80 percent white. 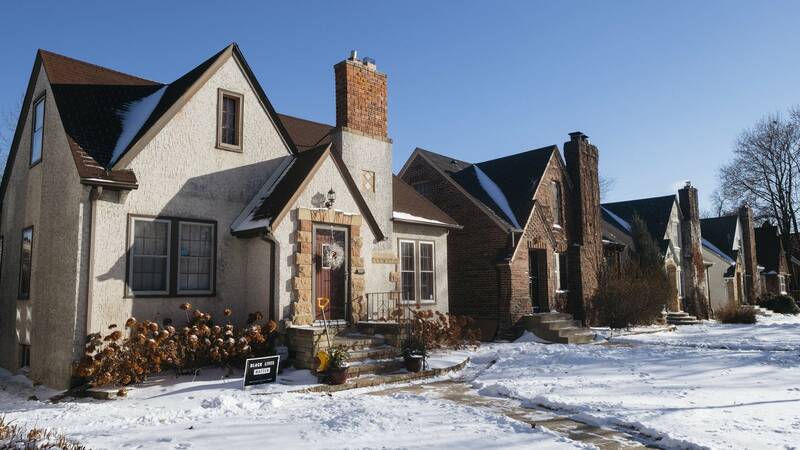 "So much of that makes sense when you think about the ways in which people hunker down into communities of sameness," said Neeraj Mehta, director of community programs at the University of Minnesota's Center of Urban and Regional Affairs. But some groups in Minnesota are more likely to live in integrated communities and have diverse social circles. At the top of the list: people of color. Only 16 percent of Minnesotans of color say hardly any of their neighbors are a different race, versus 48 percent of white Minnesotans. People of all different races might prefer to live with people like themselves, Mehta said, but it's a lot easier for a majority group such as white Minnesotans to do that than it is for people of color. As an example, Mehta pointed to his own residence in North Minneapolis, where a plurality of residents are African-American. Even there, only around 71 percent of residents are people of color versus 29 percent white. "In Minnesota, you don't have neighborhoods that are 90 percent black or 90 percent Latino," Mehta said. "You have communities that are 50, 60, 40 percent. Which means half or more of the people in your community are still white." Census estimates suggest that less than 5 percent of Minnesotans live in a city or township that's even 50 percent nonwhite, while 43 percent of Minnesotans live in communities that are 90 percent white or more. Almost all Minnesotans of color say they live in diverse communities, but there are some big differences among white Minnesotans. Among them, younger people are much more likely to say they have diverse friends and neighbors, while elderly Minnesotans are the least likely to say that. There's a big geographic difference, too. 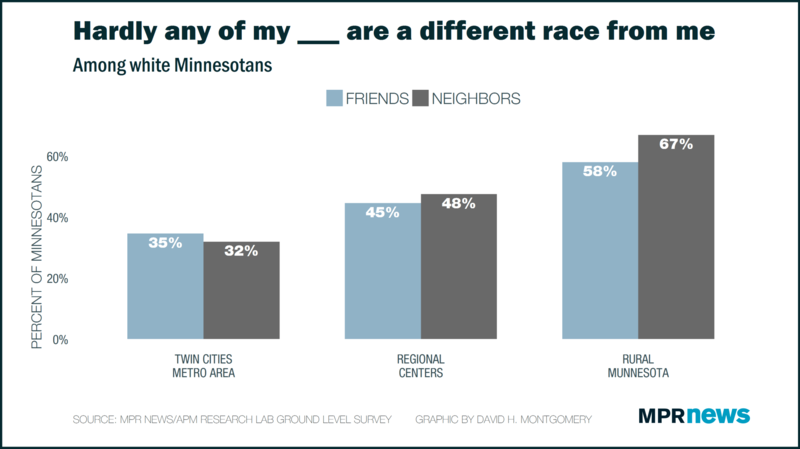 White residents of the Twin Cities and surrounding suburbs are the most likely to say their neighborhoods and friends are diverse, while white residents of rural areas are the least likely. In between are white residents of the state's regional centers: Duluth, Rochester and St. Cloud. That matches Census data showing most Minnesotans of color living in larger cities. It also correlates with the finding that older people are less likely to have racially diverse friends and neighbors, since rural Minnesota is on average older than the metro. Research shows this clustering can have real impacts. On the one hand, Americans of all stripes increasingly say they want to live with people like themselves. On the other hand, Mehta said, the consequences for people of color who do this are more dire than for white people who associate only with other white people. "When communities of color close ranks or try to self-segregate, they're penalized because of the racist ways in which we treat concentrations of people of color," Mehta said. "But when white people self-segregate or close ranks, they're simultaneously taking resources and opportunities."